Attention: Ola! Mommy, Daddy, Tita, Tito, Lolo, Lola, Ate, Kuya and to all my fellow Filipinos who know anyone or have a relative who will study or has a plan to study in any public elementary and secondary schools nationwide for SY 2015-2016. 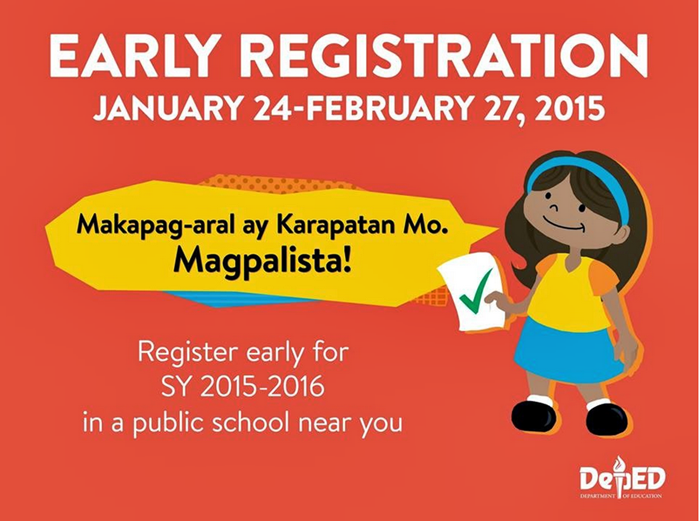 Did you know that DepEd will be holding a month-long early registration in public schools nationwide starting today, January 24 to to February 27, 2015? Go and register now, it's FREE! The month-long early registration period will give the Department a clear picture of the total number of expected enrollees and will help in addressing challenges that may arise during the regular enrollment period. Its collective aim is a smooth school opening come June. The early registration aims to ensure that all five-year old children are enrolled in kinder while all six-year old are enrolled in Grade 1 by June. Other targets of the early registration are out-of-school children (OSC) and out-of-school youth (OSY) from marginalized sectors, including street children ages 5 to 18. These targeted learners will be provided with their preferred education delivery system which could either be formal through the alternative delivery mode (ADM) or through the alternative learning system (ALS). To ensure universal participation, DepEd has enlisted the assistance of local and Barangay officials for the early registration of OSC, the OSY, those with difficulty in learning and the indigenous peoples (IPs). The early registration will see DepEd working closely with the LGUs, the Parent-Teachers Associations, Barangay officials, civil society groups, civic organizations and the business sector to ensure wide sectoral participation in the exercise of granting all learners access to education. Documentary requirements DepEd emphasized that there are no fees required for the registration. The birth certificate of the child shall be the documentary basis for early registration. If this is not available during the early registration, the document can be submitted within the school year.